Choowang, R., Lin, J., and Zhao, G. (2019). "Composition of water-insoluble extract from oil palm trunk liquefaction using polyhydric alcohol," BioRes. 14(1), 943-953. Polyhydric alcohols are known as excellent solvents for converting the main components of lignocellulose into liquefied products. However, the substances that precipitate in water include not only lignin, but also humins, especially when the lignocellulosic raw material has a high content of carbohydrates. Therefore, the main objective of this study was to investigate the composition of water-insoluble solids from the liquefaction of oil palm trunk using the solvent polyethylene glycol (PEG)/glycerol (4:1, w/w) and by using sulfuric acid as the catalyst. The results showed that the water-insoluble components had a relatively higher average molecular weight and polydispersity than those of the water-soluble components and liquefied products. The production of sugar monomers during liquefaction led to the condensation of furan products (hydroxymethylfurfural and furfural) to form humins. In this case, the humins were incorporated with the lignin and liquefying reagent. Lignocellulosic biomass includes residue waste from agro-plantations, forests, agro-industrial processes, and aquatic plants (water hyacinth), which are well-known sustainable bioresources. This biomass can be directly used as a burning fuel to generate steam and electricity or it can be converted into liquid products for use as a biofuel or into intermediate chemical products that can be used to replace fossil-based fuels and chemicals (Soenjaya et al. 2015; Isoni et al. 2018). Liquefaction is considered an efficient method for conversion of this biomass. During the liquefying process, various solvents, such as water, ionic liquids, and polyhydric alcohol, can be utilized in acid-catalyzed dehydration to generate liquid solutions or platform chemicals. Generally, the key products from carbohydrates, cellulose, and hemicellulose during aqueous acid-catalyzed dehydration of glucose and other hexose sugars are dehydrated to 5-hydroxymethylfurfural (HMF) and subsequently hydrolyzed to levulinic acid (LA) and formic acid, which are byproducts. Xylose and other pentoses are converted to LA via furfural (Kang et al. 2018). Levulinate acid ester is formed by liquefaction of acid-polyhydric alcohols. During acid thermal hydrolysis, humin byproducts are formed by the condensation of furan (HMF and furfural) and sugars, which reduces the yield of the target product (Yamada and Ono 1999; Kobayashi et al. 2004; Sarwono et al. 2017; Filiciotto et al. 2018). The main structure of humins incorporates a furan ring, with the shape and size depending on the sugar raw materials and process conditions as same as its elemental composition (Titirici et al. 2008). Humins comprise approximately 67% of carbon (Wang et al. 2016). Therefore, they have been investigated as alternative carbonaceous materials for producing activated carbon (Kang et al. 2018). Interestingly, the residues that can be obtained from the acid-catalyzed hydrolysis of lignocellulosic biomass are not only humins, but they can also be condensed from lignin, which has been confirmed in the previous study of Kang and Yu (2016). They found that the residue obtained from the eucalyptus wood in an aqueous diluted sulfuric acid solution at 170 °C for 5 h is comprised of humins and lignin. However, regarding the liquefaction with the solvent of polyhydric alcohol, only a few studies have described humins. These studies mostly focused solely on the condensation of lignin (Zhang et al. 2007; Xiao et al. 2015). Kobayashi et al. (2004) reported that the residue isolated after cellulose was mixed with lignin and liquefied in polyethylene glycol 400 (PEG-400)/glycerol (4:1, w/w) at 150 °C with a 3% sulfuric acid catalyst contained carbonyl derivatives and aromatic compounds, based on the Fourier transform infrared (FTIR) spectroscopy results. Yamada and Ono (2001) found high molecular weight substances similar to humins in the water-insoluble part from ethylene glycol cellulose liquefaction. These substances emerged from the condensation of HMF, which forms insoluble humins during aqueous acid-catalyzed dehydration (Yamada et al. 2007; Wang et al. 2016). Thus, it can be presumed that humins have a high potential to be formed during acid-polyhydric alcohol liquefaction, especially from a lignocellulosic feedstock with a high content of carbohydrates, such as the inner zone of oil palm trunks. Consequently, the main objective of this study was to investigate the chemistry of the water-insoluble part from liquefaction of the inner zone of the top parts of an oil palm trunk with PEG 400/glycerol (4:1, w/w) and 2% sulfuric acid as the catalyst. The water-insoluble part was characterized by gel permeation chromatography (GPC), FTIR spectroscopy, solid state 13C nuclear magnetic resonance (NMR) spectroscopy, and ultraviolet-visible (UV-vis) absorption spectroscopy. Fine particles (> 40 mesh) were prepared from the inner zone of the top parts of a 30-year-old oil palm trunk that was obtained from a replanted plantation in the Surat Thani province of southern Thailand. The chemical composition of the oil palm trunk that is shown in Table 1 was analyzed according to the Chinese standards GB/T 2677.10 (1995), GB/T 744 (1989), GB/T 10337 (2008), and GB/T 742 (2008), respectively. The starch content was approximately 55% in the parenchyma cells (Tomimura 1992), which are shown in the scanning electron micrographs (Fig. 1). Obviously, the parenchyma cells (P) are filled with starch (S) granules. The chemicals, including PEG 400, glycerol, and sulfuric acid, were purchased from SINOPHARM Chemical Reagent Co., Ltd (Shanghai, China) and were used without further purification. A 30-g oven-dry sample of the oil palm trunk was mixed in a binary liquefying reagent mixture of PEG 400 with glycerol (4:1, w/w), including 2% of 98% sulfuric acid in 90 g of the liquefying agent. The reaction was performed at 180 °C for 30 min in a 500-mL three-necked flask, which was immersed in a thermostated silicone oil bath with a magnetic stirrer and reflux condenser. The splitting of the oil palm trunk by liquefaction is presented in Fig. 2. 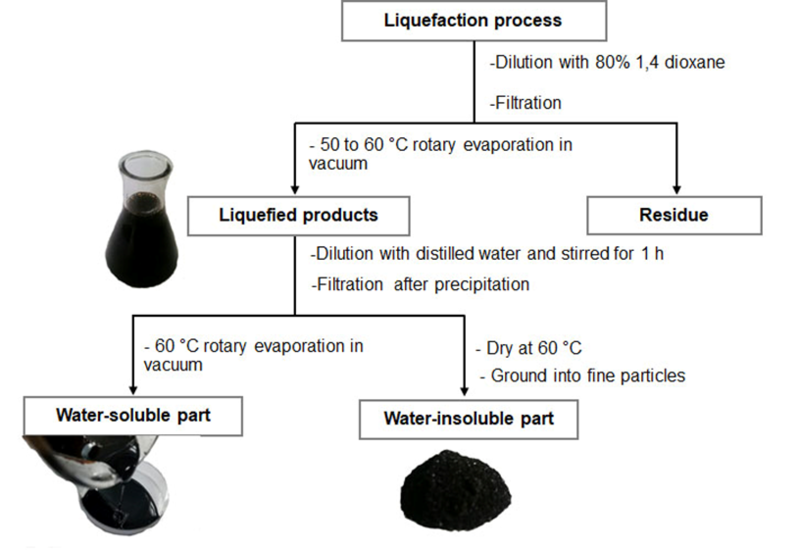 In brief, the liquefaction product was obtained through dilution with a 1,4-dioxane aqueous solution and then filtered. This was followed by evaporation at a temperature between 50 °C and 60 °C under vacuum. Afterwards, the liquefaction product was diluted with distilled water and stirred for 1 h. The precipitated substances in water as the water-insoluble part were separated using the filtration method. The brown-black solid substances were dried in an oven at 60 °C until black crystals formed. The crystals were ground into fine particles and kept in a glass bottle until used. The percentage of the water-insoluble part was calculated based on the oven dry weight of oil palm trunk. The filtered solution was removed using a rotary evaporator at 60 °C under vacuum and is the water-soluble part. The number average molecular weight (Mn), weight average molecular weight (Mw), and Mw/Mn were determined by GPC (Waters 1515, Waters, Milford, MA, USA). The mobile phase was tetrahydrofuran at a flow rate of 1.0 mL/min. The column temperature was 40 °C and monodisperse polystyrene was used as the reference. The functional groups were assessed with FTIR spectroscopy (Spectrum Two, PerkinElmer, Norwalk, CT, USA). The samples were dried before they were mixed with oven-dried KBr crystals. The mixture was placed in an agate mortar and ground with a mixing weight ratio of 1:100 (sample:KBr crystals). A few samples were pressed on a tablet press to make a transparent sheet for taking measurements. The survey resolution was 4 cm-1 with 64 scans and a scanning range of 4000 cm-1 to 400 cm-1. The water-insoluble part was further inspected with solid state 13C NMR spectroscopy (JNM-ECZ600R, JEOL, Tokyo, Japan) using a 3.2-mm probe. The measurement was conducted at 298 K with a magic-angle spinning rate of 12 kHz and relaxation time of 2 s. Each specimen was measured for a duration of 1 h.
Five milligrams of the water-insoluble part were dissolved in 10 mL of the 90% dioxane aqueous solution. A 1-mL aliquot was diluted to 10 mL of the 50% dioxane aqueous solution. A sample solution was put in a cuvette for UV-vis absorption spectroscopy (UV-3900, Hitachi, Tokyo, Japan), and further measured using the absorbance from 200 nm to 850 nm. The dry solid of the precipitated substrate in the water was 10.67% of the oven-dry weight of the oil palm trunk raw material, which was approximately twice as much as the lignin content (Table 1). The water-insoluble part showed the highest average molecular weight and polydispersity value (Table 2). The water-soluble chemicals had an average molecular weight similar to that of the original raw material with a low polydispersity, which was close to tha.t of a monodisperse polymer. The inner zone of the top part of the oil palm trunk has an abundance of carbohydrates, especially glucose derived from starch, cellulose, and hemicellulose. Approximately 55% of the starch found was in parenchyma cells in the oil palm trunk, which has a glucose content of 55% to 63% and a xylose content of 34.8% (Tomimura 1992). Thus, liquefaction of the oil palm trunk performed with the mixture of PEG 400/glycerol solution under acidic conditions has a high potential to generate carboxylic esters or carboxylic acid as a major product, according to prior research (Yamada et al. 2007). The liquefying reagent degraded lignin, amorphous structure, into the low molecular weight substrate in the early stage of the liquefaction reaction as same as hemicelluloses and amorphous zone of cellulose and starch (Zhang et al. 2012). The liquefying reagent is further reacted with the aliphatic hydroxyl groups of the degraded lignin to form the ether linkage, especially at lignin’s α carbon position. Hemicellulose is decomposed into sugars monomers comprised of the highest ratio of xylose and tiny amounts of others pentose sugar such as arabinose, mannose, and galactose. Glucose was obtained mainly from the solvolysis reaction of cellulose and starch. All of the sugars (hexose and pentose) formed LA or levulinate esters as final products, as is exhibited in Fig. 3. Formic acid or formate esters also could have emerged (Kobayashi et al. 2004; Yamada et al. 2007). Furthermore, HMF and its derivatives, furfural, and other intermediate chemicals may have been present during oil palm trunk liquefaction, according to the literature (Zhang et al. 2007; Xiao et al. 2015). 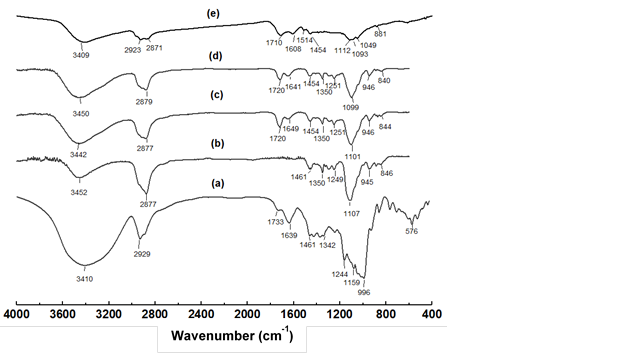 Figure 4 shows the FTIR spectra of oil palm trunk, PEG400/glycerol (4:1, w/w), original liquefied product, as well as the water-soluble part and water-insoluble of liquefied product. It was demonstrated that the contents of oil palm trunk were almost completely liquefied under the conditions of study. The spectrum of the water-soluble part was nearly a duplicate of the original liquefied product. Apparently, the liquefaction products of the oil palm trunk were mostly extracted by water. The main peak liquefaction reagents consisted of the O-H stretching vibration of hydroxy group at 3450 cm-1, the C-H stretching vibration at 2879 cm-1, the C-H bending vibration in the range of 1454 cm-1 to 1350 cm-1, the C-H deformation at 1251 cm-1, the C-O stretching vibration at 1099 cm-1 and the O-H deformation at 946 cm-1, which had slightly shifted from those of the original product (curve c in Fig. 4). The C-O stretching vibrations at 1099 cm-1 overlapped with the C-O-C stretching vibrations in ethers or esters, which were derived from the degraded product of the oil palm trunk and liquefying reagent (Kurimoto et al. 2000). With consideration of curve d of Fig. 4, the new peaks at 1720 cm-1 and 1099 cm-1 were attributed to C=O and C-O stretching vibrations, which indicated the presence of carboxylic acid or carboxylic acid ester. The peak at 1640 cm-1 (C=C stretching) was characteristic of a furan ring. This indicated the production of HMF, HMF ether, or furfural. During liquefaction, the carbohydrates polymer in oil palm trunk is mostly degraded into small fragments or sugar monomer, which led to a high concentration of furan products as intermediate chemicals that were unstable in the acidic solution especially furfural. This situation is conducive to the formation of humins (Liu et al. 2018; Kang et al. 2018). Therefore, the water-insoluble part was possibly derived from the condensation of HMF, various intermediate products, and furfural. Both wavenumbers of C=O and C=C stretching in the humins shifted slightly to lower wavenumbers compared with that for the original form. The FTIR spectra of the water-insoluble part (curve e in Fig. 4) had clear peaks at 1710 cm -1, 1608 cm-1, and 1049 cm-1 that corresponded to C=O, C=C, and C-O stretching vibrations in the furan ring, respectively. These absorbances were shifted from those of the water-soluble part. The C-H stretching and C-H out-of-plane vibrations were present at 2923 cm-1 and 881 cm-1, respectively. The new peak at 1514 cm-1 arose from C=C stretching in the humins derived from the xylose (van Zandvoort et al. 2013; Wang et al. 2016). However, peaks around 1608 cm-1 and 1514 cm-1 were also detected, which indicated an aromatic skeletal benzene ring in the lignin. Also, the water-insoluble part contained liquefying reagent, as its FTIR spectra clearly showed C-O and C-H stretching vibration peaks at 1092 cm-1 and 2871 cm-1, respectively. Accordingly, it seemed reasonable that the water-insoluble parts consisted of humins with some amount of lignin. These parts also incorporated residues of the liquefying reagent, which was confirmed by C-O-C stretching of ether/ester linkages at 1112 cm-1. Solid-state 13C NMR spectroscopy was applied to study the molecular structure of the water-insoluble part (Fig. 5). The chemical shifts for various carbon structures overlapped, which was similar to the FTIR results. The chemical shifts of the water-insoluble part were similar to the humins derived from a variety of sugars. The signal between 107.7 ppm and 149 ppm indicated furan rings in the humins and benzene rings in the lignin (Gallacher et al. 1994; Titirici et al. 2008). However, the aliphatic carbon atoms had different signals. The aliphatic carbon atoms of the humins were observed between 50 ppm and 15 ppm, while lignin had signals between 67.1 ppm and 64.2 ppm. The methoxy groups of lignin appeared at 56.6 ppm (Jasiukaitytė-Grojzdek et al. 2012; Wang et al. 2016). The tiny signal observed around 173.5 ppm was the carbon in the carbonyl group (C=O) of the aliphatic ester or acid. The sharp signal at 71 ppm corresponded to C-O in the structure of PEG400 and glycerol polymer (Yoon et al. 2015). This confirmed that some residue of the liquefying agent was included in the water-insoluble part. It might be grafted onto the structure of humins and/or lignins. Both the liquefying reagent and humins could react with the Cα position in the aliphatic lignin to form ether linkages, which are displayed in the signal around 132 ppm (Jasiukaitytė-Grojzdek et al. 2012; Nge et al. 2018). Besides, the signal at 71 ppm might overlap with the ether linkage between the furan ring in the structure of humins (Kang et al. 2018). Ultraviolet spectrophotometry is well known for investigation and characterization of lignin. The band at 280 nm was related to the benzene ring in lignin (Kumar et al. 2016). In contrast, the UV spectrum of the water-insoluble part of the oil palm liquefaction product exhibited the highest absorbance at approximately 264 nm, which shifted to a lower wavenumber compared with that for the lignin. This may have been because of its incorporation of lignin and humins. Humins were indicated in the range from 217 nm to 245 nm, which was in good agreement with the absorbance of the furan ring in humins reported in a previous study (Gao et al. 2015). The high concentration of sugar monomers from the degradation of carbohydrates in the oil palm trunk promoted rich amounts of furan, including HMF and furfural. The furan was further condensed to form humins, which were suspended in the liquefying reagent. The high molecular weight substrates that precipitated in the water had high contents of humins and lignin, which can be called ligno-humins. 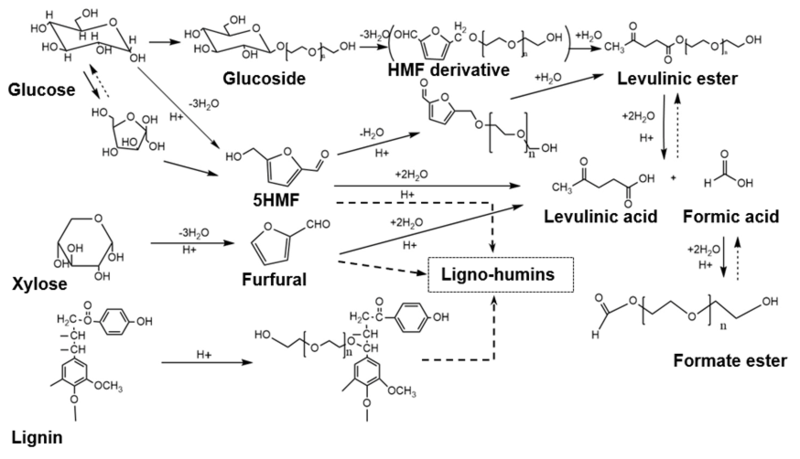 Some residues of the liquefying reagent became grafted into the structures of the humins and/or lignin, according to the FTIR and solid state 13C NMR analyses. GB/T 10337 (2008). “Raw material and pulp-Determination of acid-soluble lignin,” Standardization Administration Committee of China, Beijing, China. GB/T 2677.10 (1995). “Fibrous raw material-Determination of holocellulose,” State Administration for Market Regulation, Beijing, China. GB/T 742 (2008). “Fibrous raw material, pulp, paper and board – Determination of ash,” Standardization Administration Committee of China, Beijing, China. GB/T 744 (1989). “Pulps – Determination of α-cellulose,” State Administration for Market Regulation, Beijing, China. Yoon, K., Takahashi, S., Nge, T.T., Karlsson, O., Nakagawa, A., Ohi, H., Uraki, Y., and Yamada, T. (2015). “Thermal melting of lignin derivatives prepared from dried black liquor powder of softwood soda-AQ cooking and polyethylene glycol,” BioResources 10(1), 912-921. Article submitted: September 12, 2018; Peer review completed: October 5, 2018; Revisions accepted: December 10, 2018; Published: December 11, 2018.